I'm trying to think of ways to collect as many steel snowflakes and take advantage of the upcoming refunds with the CV rework. If, as I understand it, current CV XP will be converted to FXP with the rework, would it make sense to spend some FXP now to get T9-10 ships, knock off the snowflakes to get steel, then recuperate that when my CV XP is converted with 0.8.0? If that kind of a refund is actually going to happen, WG may not be liking me much; I have a mil+ xp on my Bogue. Sounds good? Ultimately though you’ll have to decide if the credit and xp/fxp outlay needed to get that steel is worth doing. I FXP the CVs for the steel plus bought the camos when they were 50% off. Now just to wait for the chance to refund it all lol. You won't get the mil+ back in FXP. XP currently on the ships will be transferred to either the CV below or to the t1 of that nation. The only XP being refunded as FXP is the XP spend on the ships. My understanding is you get the free experience if you don't keep your CV's and as Kapt Wuff mentioned that is only for the experience invested into the ship, the convertible experience will go to that nations T1 ship. . They should probably put a minimum time for reacquiring those CV's to avoid abuse with people selling them and immediately buying them back. So the convertible experience becomes useless? May have to make sure to screenshot the before and after; gonna be a riot to see a million xp on Erie. I’d rather keep the ship; even if I can’t use it; I think Bogue holds more nostalgia value than any other ship in my port, except perhaps Warspite. It continues to be convertible. Same. Just hope the CV rework doesn't get delayed or worse cancelled. 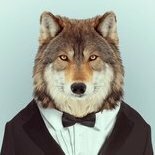 I mean I don't like the rework but at least we're getting compensated, handsomely in fact. It is exactly like it is now. My understanding is you will be able to "sell" the researched ship for free xp up to the cost of the ship (and researched modules). But any xp on the ship will be transferred to the respective ship. They are not going to cancel it and theyu always do well by the customer when things like this happen. But if it moves to T1, then it is useless. So, it stays on the ship you might own? Or does it go to tier 1? Bouge is odd tiered though, so it's gonna automatically be removed. Convertible XP is always "useless." You only accumulate it on elite ships. Elite ships have already researched all upgrades and unlocked all possible ships next on the tech tree. Whether it is on the Erie or the Bogue or any other ship makes zero difference. If it’s on tier 1 it’s just as useful as tier 5 - you have to spend doubloons to do anything with it no matter where it is. It should be to tier 4. That way you’ve got all the EXP from the Bogue now going towards the grind to tier 6... just like it is now. I’m on the Shokaku and Essex with about 40% of the EXP needed to jump to the Taího and Midway. In my case I will have the Shokaku with about the same EXP applied to it and then the Lexington with a bunch of EXP on it. I should be about the same distance from the Tier 10s as I am now - if anything i’ll Be closer based on what they said. Tier 1's cost nothing to buy so all you need is an open port slot to access the convertible experience and you can simply sell it back for what you paid as soon as you are done converting. The Bogue is going away and will be replaced in the new even tier only trees and the other odd tier CV's are moving to even tiers. I have the T-5,6,7 US CVs so what happens. Oh, I know; and that’s part of the reason the rework hacks me off. Bogue leaves; since you don’t have Langley the rest may go away as well. Not sure about Independence, but I think Ranger becomes the ‘new’ T6. If you refund the CV's your ship convertible experience on elited ships will revert back to the T-I of that nation. 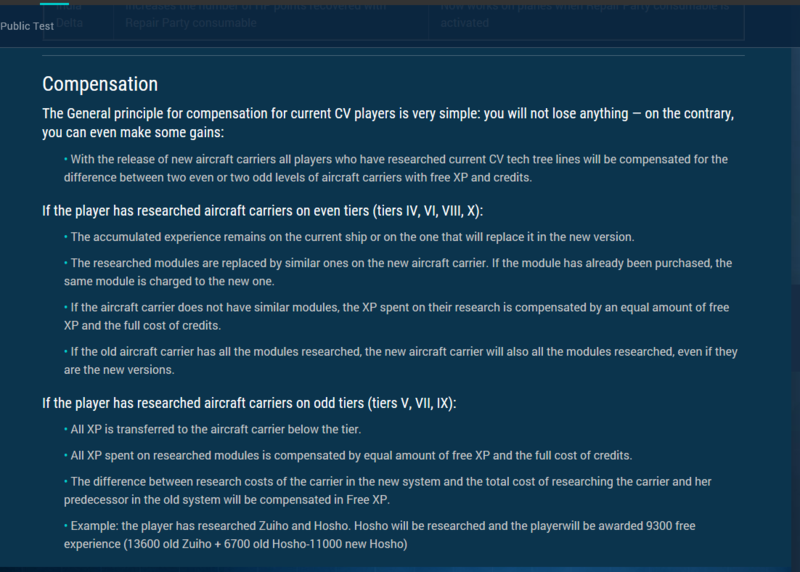 WG will only be refunding the cost of researching the ships/modules as FreeXP + Credits. See here under compensation. That's not right. Maybe I'm understanding wrong, but in the case of Bogue, if I'm building convertible points grinding towards Independence at 38k xp, then it will get fipped back the T1? That sorta screws me since I now need to spend doubloons to make the XP work towards whatever carrier is at T6. They apply the convertible points to Langley at T4 so I don't lose progress in the CV line grind. BTW- I"ve researched all other U.S. ship lines so spending doubloon would be my only choice. That's not right. Maybe I'm understanding wrong, but in the case of Bogue, if I'm building convertible points grinding towards Independence at 38k xp, then it will get fipped back the T1? That sorta screws me since I now need to spend doubloons to make the XP work towards whatever carrier is at T6. They apply the convertible points to Langley at T4 so I don't lose progress in the CV line grind. BTW- I"ve researched all other U.S. ship lines so spending doubloon would be my only choice﻿. If you haven't unlocked Independence, it'll go to the Langley. If you have unlocked independence and all of the Bogue's modules, it doesn't matter where it goes but it'll go somewhere. No more so than it already is. When you convert XP, it doesn't matter what elite ship it comes from. All your XP will be moved to Langley, and still counts towards Indy. Any XP you spent on Bogue modules (including a sizable portion of the Bogue itself) gets refunded as free XP. The only downside is, if you don't have enough XP to unlock Indy before the switch, and you sold Langley when you got Bogue, you'll have to rebuy it to continue grinding towards Indy.